Image via Journal of Book of Mormon Studies. Archaeologists excavating in Jerusalem discovered a small stamp seal (a clay emblem that would be used to mark documents with a signature) in the 1980s belonging to a certain Malkiyahu ben hamelek, or Malkiyahu son of the king. 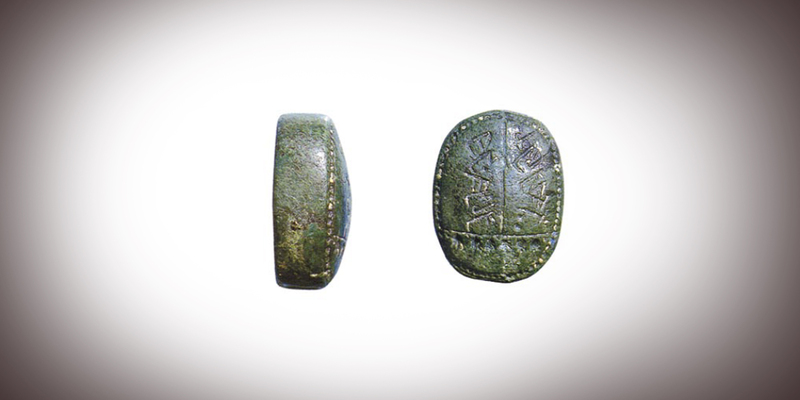 Dating to the late 7th to early 6th centuries BC, “The oval-shaped stamp seal of Malkiyahu ben hamelek was fashioned of bluish green malchite stone and is very small, measuring just 15 mm long by 11 mm wide (smaller than a dime) and only 7 mm thick.”1 Although small, this stamp seal carries great importance for establishing the historical existence of one of the Bible’s more enigmatic figures, and potentially for a Book of Mormon personality. Turning to the Book of Mormon, Mulek (or Muloch2), the son of Zedekiah (Helaman 6:10; 8:21; cf. 1 Nephi 1:4), makes his first appearance in Mosiah 25. According to the Nephite record, Mulek escaped the massacre of his family at the hands of the Babylonians (cf. 2 Kings 25:1–7) and established a colony in the New World in a region later named Zarahemla, after one of Mulek’s descendants (Mosiah 25:1–5). Upon their discovery, the so-called Mulekites joined with the Nephites and accepted Mosiah as their king (Omni 1:12–19). The name Mulek is not found in the King James Version of the Bible. Still, some Latter-day Saint scholars have proposed that Mulek is a hypocoristic (abbreviated or shortened) form of Malchiah/Malkiyahu, or a form of this name that dropped the divine name (yhw) element, leaving only mlk (meaning "king").3 (Hebrew during the time of Nephi and Lehi was written without vowels.) If the Bible's Malchiah is the same person as the Book of Mormon's Mulek, then the stamp seal belonging to Malkiyahu would lend independent credibility to the historical existence of Mulek.